Charming 18th Century cottage in the grounds of the owners property in the heart of the village of St Jean D'Angle in the Charente Maritime. Situated just 10 minutes from the bustling town of Rochefort-sur-Mer, 20 minutes from Royan, 35 minutes south of La Rochelle, 15 minutes to the nearest beach and within half of an hour of the Atlantic Islands of îLe de Ré, île Madame, île d'Oléron and île d'Aix. Within a couple of minutes you can walk to the bakery, the bar/tabac, the market on a Sunday morning and the fortified chateau of St Jean D'Angle. The village of St Jean D'Angle is right on the edge of the Marais de Brouage, the large area of salt marshlands south of Rochefort, there is an abundance of wildlife and birdlife as well as amazing cycling and walks to be had in the Marais and it is a fascinating place to take a picnic and spend a day exploring. There is so much to do in this area whether you want to relax in the garden, walk, cycle, visit the regions many romanesque churches, visit local markets, dine on the famous Marennes-Oléron oysters or sample the local Pineau Charente wine. There are also numerous beaches (one for every day of the week within half an hour's drive), the islands to explore and the towns and cities to wander around. Rochefort-sur-Mer has many excellent restaurants, it is home to the replica of the Hermione, the famous Corderie Royal and Maritime Museum and park. It has a produce market three days a week and it is easy to spend a morning sipping coffee in the Place Colbert in the centre of town or to take an evening Aperatif there and watch people coming and going. This city has exceptionally easy parking and access. The cottage is adjacent to, but separate from the owners property, it is situated within the 1.5 acres of gardens and is all on one level. The cottage has one double bedroom with en suite bathroom with shower and quality toiletries included. A fully equipped kitchen with fridge/freezer, microwave, dishwasher, washing machine, electric oven and hob, coffee maker, toaster, small island unit and 2 bar stools in fact everything you could wish for to make your holiday stress free and perfect. The large sitting room has a colour television, an extremely comfortable leather L-shaped sofa, stereo and an iPod docking station. The sitting room also has the dining area at the end next to the kitchen with a large round table and comfortable modern seating. The property is furnished with a mixture of modern and vintage furniture and original artwork. Leading straight off the sitting room is the terrace overlooking the gardens of the entire property. A retractable awning covers the outdoor wooden dining table and chairs if it is too hot. To the side of the property is a small walled garden with a huge fig tree and grape vine. This walled garden also has street access with a door in the wall, but is not overlooked and is private for your use. Guests are welcome to wander around the gardens of the entire property, they are charming and pretty, but this is a family home rather than a manicured chateau! Feel free to pick vegetables that are ripe from the potager and figs, grapes and other fruits according to the season. We do not use pesticides or chemicals in our garden and our vegetables and fruits are all totally organic. This means we have an abundance of butterflies, birds and some bats at the far end of the garden. However, as this is organic please do excuse the odd weed! Roaming the garden are also our free range chickens, two cats and two dogs. You are very welcome to sit and while away some time on our children's wooden swings or borrow bicycles and go off exploring. Our wooden above ground pool is solar heated and is available for you to use whenever you wish. The property has been recently renovated and every effort has been made to make the cottage as comfortable and as welcoming as possible. We will happily cater to your needs, if you would like us to get groceries in advance we are happy to do so. We automatically include a welcome pack with a bottle of wine, French bread, cheese and fruit. We can accommodate a third person in a camp-bed in the sitting room or provide a travel cot for a baby/toddler along with a high chair. Included in rental are all bed linens, towels, tea towels and quality organic toiletries. We are on hand should you need us. If you feel like sharing a glass of wine and a chat in the evening sunshine and telling us about your day and planning the next one we would love you to join us, on the other hand if you would like to be left in peace and privacy then we will totally respect that - this is your holiday and we want you to enjoy it to the full. Parking is on the street opposite the gite. We have lived in France for many years and our children are educated here. We have had the incredible opportunity to live in several far flung countries around the world, but we always return to France, this is where we call home. We have now settled here, in the Charente Maritime, permanently - it is where we love to live as a family. My husband is a keen fisherman and would love to show you around the local fishing areas. We are both passionate about nature and wildlife and keen to help anyone explore the amazing Marais de Brouage which adjoins the village - it is a wonderful habitat for many species of wildlife. We love cooking, growing our own vegetables, our garden, cycling and enjoying the French lifestyle. This is the perfect property for us, just 15 minutes from the beach and the coast, just 10 minutes into the thriving beautiful city of Rochefort. We have 1.5 acres of beautiful park like gardens and yet we are in the heart of the village. We are not isolated, we are able to walk to the village school, the bakery, the bar and the post office. There are lovely walks through the village and surrounding countryside finding tiny vineyards and beautiful views. Finally there is the Marais de Brouage, the most incredible habitat for wildlife, it is right on our doorstep and it is hard to beat for walking and cycling. In short the area is perfect! The en suite bathroom is in a more traditional style with a modern glass high pressure shower. Quality soaps, shampoo, conditioner and hair dryer are all included for your convenience and to make life that little bit easier. Washing detergents are included in the rental. We don't have private spaces. Parking is on the street, directly outside the cottage. Extremely spacious and comfortable sitting room with wood burning stove, leather sofa, colour television, iPod docking station/speaker and a small library of books. A welcome pack will be provided with a bottle of wine, traditional French baguette, cheese, butter, fruit and milk, teas and coffee. We will gladly do a full shop for you upon request. Charming freestanding kitchen with a contemporary feel. Vintage French marble counter tops and quality appliances. Extremely comfortable dining area in the sitting room with ample space for 6 or more and outside on the adjoining terrace with full shade awning if required. You are welcome to use our own bikes, please just ask. Solar heated above ground pool shared with the owners. Ideal for a family with just one child, teenager, toddler or baby. Ideal for one, two or three adults. Perfect for a couple wishing to explore and relax in semi-rural France but with so many attractions all close-by. We want this to feel like a home from home and in order to make your stay as perfect and as stress free as possible we have included all the niggly little things like shampoo, shower gel, conditioner and dishwashing and laundry detergents as part of your rental. We can just recommand this place as it is well placed to visit the hole area between La Rochelle and Sainte. The gite is confortable and can easily accomodate 3. But above all what made this stay really special is the familly, Susie, Roddy and the dogs( :-) ), are really a welcoming couple, they care with the upmost kindness of their guest, being really friendly and helpfull. We can not wait to see them again! In September 2018 my partner and I stayed in this charming, very comfortable and well-equipped gite located in a quiet village (with its own fortified castle well worth a visit) making an ideal base for exploring the surrounding area. We visited Marennes (superb seafood lunch in La Cayenne) and the Cote Sauvage, La Rochelle and the Ile de Re, Saintes, Saint-Emilion (a 2-hour drive away for a great day out wine tasting) and Rochefort (enticing food market on Tuesday mornings), as well as more local places such as Pont-l'Abbe-d'Arnoult (handy for a shop at the Carrefour supermarket and coffee and beers at one of the cafes around the central marketplace) and the smallish but impressive Chateau de la Roche-Courbon. If we had wanted to pack a lot into our week's stay we could have done much more, but we also made time just to hang out and appreciate the comforts of the gite itself and dine al fresco on the patio whilst looking out onto its beautiful spacious garden. However, it was our hosts, Susie and Roddy, and their lovely family, along with Bentley and Evie, the cutest of Jack Russells, who made our stay exceptional. We couldn't have asked for a warmer, more friendly and informative welcome to make us feel truly comfortable and relaxed. 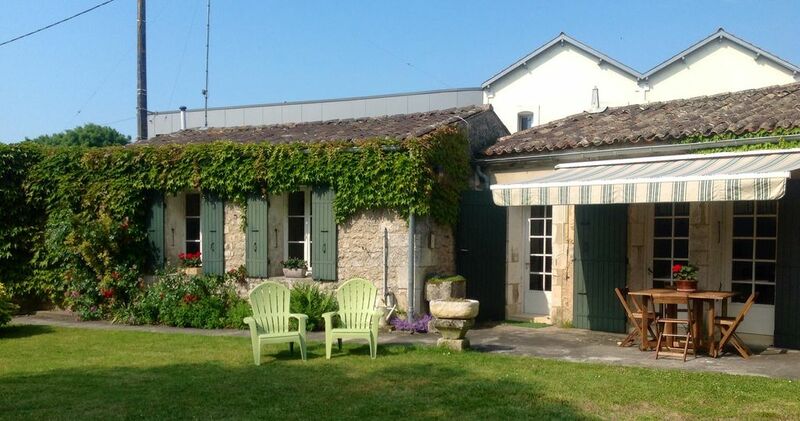 We only wish we had been able to stay a lot longer and would not hesitate to recommend this gite for a wonderfully peaceful and interesting holiday. Compact with wonderful hosts and great location. This house is well situated for shade when very hot, yet has a cozy feel inside and, we suspect, would be great also in cool periods of the year. Susie and Roddy were the most relaxed and gentle of hosts. We luckily met all the children at different times and each is very interesting in their own way. Although not dog lovers, we loved little Bentley and now miss the kitchen waste disposal units - the Jack Russels - who visited us daily. We were honoured to share a fascinating meal under the stars with the family and friends and learnt much from the insights we received. The area is so varied. We decided we would try to visit somewhere new each day during our two weeks; this we did except on the one day when it was poor weather; this took us back to the wonderful Saintes. Rochefort and its museums is very close and Brouage was much more lovely then we'd expected. Traffic seemed heavier than ever from our last visit to the area but patience is rewarded once on the Île d'Oléron. Royan looked much smarter than before; we passed through on our way to the Côte Sauvage. Cayenne, la Tremblade and Bourcefranc provided wonderful visits and the latter wonderful because we witnessed the frantic 90 minutes or so when the oyster boats come in to unload. The house itself has a much larger lounge and dining area that the images show, and the kitchen is well designed which is necessary in such a compact space; preparing our own meals was easy with an excellent cooker and uncomplicated appliances. The bedroom requires some careful movement and the generously proportioned might find it and the small toilet a bit of a challenge. We we're well aware of the proximity of a road and the fact that parking is on-street. Given the convenient little gate in, this never presented a challenge. The village has many lanes and quiet roads off the main one for strolling. The marshes, which we viewed, but did not explore, showed us fantastic bird life. We earnestly hope that visiting France remains straightforward so that we might re-visited Susie and Roddy for we count this one of our best three out of more than 50 such holidays. Thank you, thank you, thank you Roddy, Susie, the children, Bentley, Evie and assorted other wildlife for such a memorable stay. We enjoyed a fabulous holiday in the gite. The weather was fantastic and we had a relaxing time. The gite was great and like a home from home and Susie and Roddy and their wonderful family really made us feel welcome as did their lovely dogs! Lovely cottage, lovely garden and in a lovely area, but most importantly owned by a lovely family. Must not forget to mention the dogs, who we miss now that we are back home. Susan,Roddy and their family once again (second visit) made our 2 week holiday really fantastic and welcoming. The gite is perfect and has everything you would need to enjoy a relaxing break in an ideal location with absolutely perfect weather to boot. The beautiful beaches of Ile deloron are only a short drive away and are perfect for all the family as is the magnificent Marrene which is a very pretty village with weekly markets and of course a lovely beech. We would always recommend this gite and the area to our friends and family who we know would be made as welcome as we by a wonderful family.